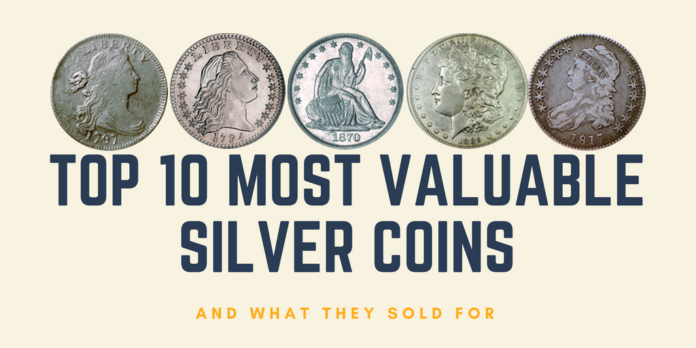 The most valuable Silver Coins starts from the free market’s selection of the Spanish silver dollar all the way to the modern Federal Reserve Note, the story of America is told through the coins and currency Americans have used over the years. The silver coins below are listed in order of their highest quoted sales prices found on the Internet. These quotes are normally for highly graded coins in unusually good condition. Some coins on this list are worth very little in average or worse condition. Luckily, our list starts near the beginning of the story – with the first dollar coin ever produced by the U.S. government. From the 1776 Declaration of Independence through the 1787 ratification of the Constitution, and for several years thereafter, the U.S. federal government stayed out of the money business. That all changed in 1792. In his third State of the Union address, President George Washington urged Congress to provide for a National Mint. One was authorized by the Coinage Act of 1792, but the U.S. Mint’s first dollar coins weren’t struck until two years later. 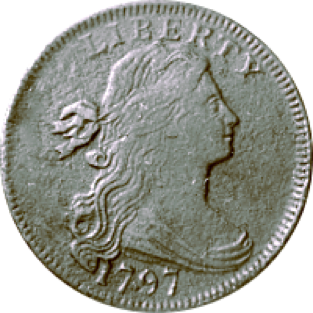 The 1794 Flowing Hair Dollar was the first. Prior to the nation’s first Coinage Act, Americans had already declared the Spanish “dollar” their money of choice. Thus, the U.S.’s first official currency was based on the Spanish silver dollars that were already circulating in the states. The first U.S. dollars were 90% silver with 0.7735 troy ounces of silver content. They traded at par with Spanish dollars, which were 93% fine and had 0.8831 ounces of silver content. Even this early in its history, the U.S. government was engaging in debasement. But 1794 Flowing Hair Dollars aren’t valued for their metal content, which at July 2018 silver prices would only make them worth about 12 bucks apiece. Instead, the coins are highly prized for their rarity and historical significance, and one sold for more than $10 million in 2013. This auction price more than doubled the previous record for a coin of $4.1 million, making the 1794 Flowing Hair Dollar the most valuable coin ever sold. Back in the 1790s, Congress was still responsive to the people’s demands. Americans didn’t like the original “Flowing Hair” design of their currency, so in 1796 Congress commissioned a new design. The “Draped Bust” is what they came up with. Draped Bust Half-Dollars minted in 1796 and 1797 feature what’s known as the “small eagle” design. Very few of these coins were ever minted, and the Mint scrapped the “small eagle” design in 1798. As a result, collectors must have either a 1796 or 1797 “small eagle” to complete a type set, and this keeps these coins in high demand. Only 934 “small eagle” Draped Bust Half-Dollars were minted in 1796, while 3,000 were produced the following year. Nevertheless, 1797s command a higher market value. In a May 2015 auction, a 1796 Draped Bust Half-Dollar sold for $822,500; while a 1797 sold for $1,527,500. Both coins were graded MS-66. 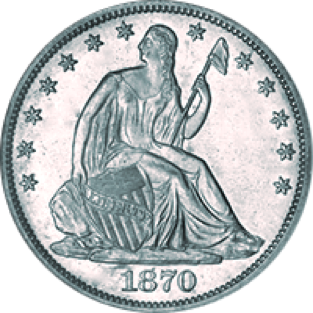 The Seated Liberty Dollar was struck from 1840 to 1873. It was the last silver dollar produced by the U.S. Mint before the Coinage Act of 1873, which ended “bimetallism” in the U.S. and temporarily put the nation on a gold standard. By 1870, the California Gold Rush had caused the price of gold to fall relative to silver, and as a result, people were hoarding and even melting down their silver coins. As Gresham’s Law explains, bad money drives good money out of circulation. This makes all silver coins minted prior to 1873 rarer than they would otherwise be, but the 1870 S Seated Dollar is the rarest of all. Just how rare is the 1870 Seated Liberty Dollar that was struck in San Francisco? Nobody even knows, since their striking wasn’t recorded in the Mint’s records. There’s not even a record of the U.S. Mint sending San Francisco any 1870-dated obverse dies, which would have been necessary to produce the coins, but the coins exist nonetheless. How the 1870 S Seated Liberty Dollar came to be produced is a mystery, and that, along with its accompanying rarity, makes the coin one of the most collectible in the world. One sold at auction for $1,092,500 in 2003. When the German Empire stopped minting silver coins in 1871, demand for silver dropped and so did its price. In response, the United States passed the Coinage Act of 1873 and put the country on a gold standard. But going from using gold and silver as money to using just gold caused a contraction in the total money supply, and lower prices (deflation). This hit U.S. farmers particularly hard, since the prices they received for their crops went down, but the interest payments they owed to banks did not. As a result, many farmers who lost their properties demanded that the U.S. resume the free coinage of silver. By 1878, Congress was ready to give into populist pressure and resume limited coinage of silver. The Brand-Allison Act mandated that the federal government purchase a certain amount of silver each year to be used in minting coins, and from that year until 1904, the U.S. Mint produced Morgan Silver Dollars. In case you were wondering, Morgan Dollars weren’t named for the infamous J.P., but for coin designer George T. Morgan. Most Morgan dollars aren’t very rare, and coins that actually hit circulation usually aren’t worth much more than their melt value. But mint-condition Morgans are extremely uncommon, and the 1889 Carson City (“CC”) Morgan might be the hardest-to-find in mint or close-to-mint condition. One sold for $881,250 in 2013. 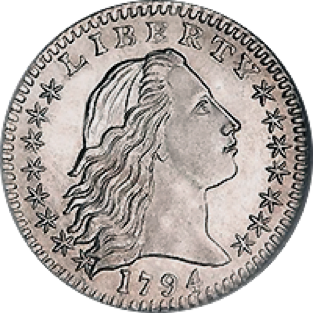 As noted above (see #2), the 1796 Draped Bust Half-Dollar was the first U.S. half-dollar coin to not feature the unpopular “Flowing Hair” design. Only 934 were ever produced, and one sold at an auction in May 2015 for $822,500. 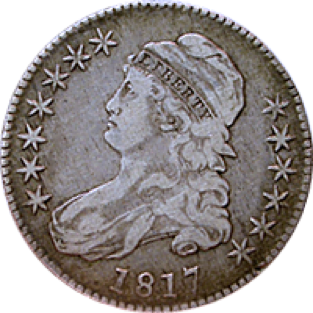 The “capped bust” design replaced the “draped bust” and appeared on U.S. half-dollars from 1807 to 1839; quarters from 1815 to 1838; dimes 1809 to 1837; and half-dimes from 1829 to 1837. Capped bust half-dollars sported a large design and the national motto (“E Pluribus Unum”) on their obverse from 1807 through 1835; while those minted from 1837 through 1839 feature a smaller design and no national motto. (Coins struck in 1836 can be of either design). Half-dollars from this time were 90% silver, with about 0.36 troy ounces of silver content. All silver coins produced by the U.S. Mint were struck in Philadelphia until 1838, when the Mint opened a New Orleans branch. Coins struck there are marked with an “O,” and all 1838 silver coins with “O” markings have significance as firsts-of-their-kind. 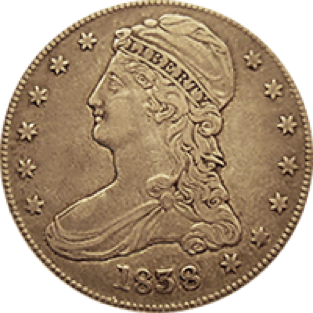 But the 1838 O Capped Bust Half-Dollar has particular significance. Due to an outbreak of Yellow Fever in New Orleans in 1838, very few half-dollars were produced there that year, and only 13 are known to exist today. One sold for $763,750 in 2014. Remember the Brand-Allison Act? (See #4, above). It didn’t satisfy the free-silver populists, and by 1890 they had successfully agitated for the government to purchase even more silver, partly by using gold or notes redeemable in gold. This helped spark the Panic of 1893. These factors contribute to the rarity of 1893 Morgan Silver Dollars. An MS-65 1893 Morgan Silver Dollar struck in San Francisco (and thus marked with an “S”) sold for $642,260 in 2014. 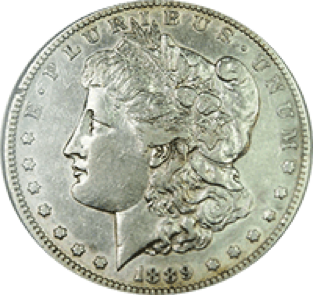 Morgan Silver Dollars were produced in large quantities most years, including 1901, when nearly 7 million were struck in Philadelphia (and thus marked “P”). Indeed, a 1901 P Morgan Silver Dollar in “average condition” is worth less than $50, according to CoinTrackers. But for whatever reason, mint-condition 1901 P Morgan Dollars are incredibly rare, and coins graded MS-60 sell for around $3,000. There have been fewer than 40 ever graded higher than MS-63, and only three MS-65 or better. The finest, an MS-66, was reportedly purchased for $575,000. Back before the Federal Reserve could print money out of thin air, the federal government actually had to operate within a budget. Even the U.S. Mint, with its ability to literally coin money, didn’t have unlimited access to funds, and purchasing new coin dies every year was expensive. To save money, the Mint would reuse the same dies from previous years and simply “punch over” the final digit of the original year. One highly prized overdate coin is the “1817/4” Capped Bust Half-Dollar. These coins were struck in 1817 using the 1814 dies, but with a “7” punched over the “4” in the original date. The original “4” is still partially visible underneath the new date. Overdating was common enough that overdate coins aren’t considered “errors.” 1817/4 Capped Bust Half-Dollars aren’t valuable because they’re overdates, but because they’re incredibly rare. Indeed, they are the rarest half-dollar coins ever produced by the Philadelphia Mint! The first 1817/4 Capped Bust Half Dollar wasn’t discovered until 1930 – 113 years after it was struck into existence. Edward T. Wallis, the man who discovered the coin, noted a die break “clear across the obverse” and hypothesized that the die broke in half when the coin was struck. Since then, only 10 more specimens have been discovered, and one sold for $282,000 in 2015. Rounding out our list is the 1884 Morgan Silver Dollar. Like other Morgans, an 1884 in average or worse condition isn’t very rare, and thus isn’t worth very much. But according to CoinTrackers, those certified MS+ can be worth as much as $215,000 at auction, and current listings for MS-65 coins are over $100,000. The list above tells the story of the dollar’s initial selection as the people’s money, followed by the U.S. government’s initial debasement of the currency and experiments with early coin designs. By the time the 19th century was in full swing, America’s bimetallic standard was causing all the predictable problems, and changes to monetary policy helped make certain coins rarer and more valuable. There’s no coin on this list from after 1901, and that’s largely because the Federal Reserve Act was passed in 1913. The gold standard was suspended for America to fight World War I, and then gold-convertibility was limited to foreigners in the run-up to World War II. Silver was removed from U.S. coinage in 1964, and the dollar became a purely fiat note in 1971. Knowledge of coins requires knowledge of the political and economic factors that make some coins rarer and more valuable than others. Coin collectors are, almost by definition, educated citizens. Perhaps the key to “Making America Great Again” is to make coin collecting popular again.